Danny Woodhead is a professional American football player for Baltimore Ravens, National Football League (NFL) and plays as a running back. In 2008, New York Jets signed him as an undrafted free agent. Moreover, he also played for New England Patriots and San Diego Chargers. During his college days, he made several records. In 2006 and 2007, he regularly won the Harlon Hill Trophy. 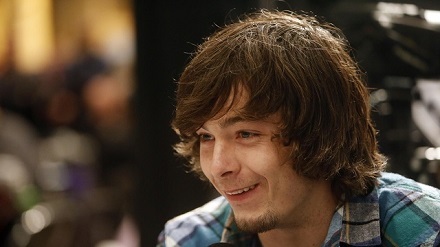 Danny Woodhead was born on January 25, 1985, in North Platte, Nebraska, United States. His parents are Mark Woodhead and Annette Woodhead. His father played as a wide receiver for the Chadron State Eagles in the late 1970s. Woodhead grew up along with his sibling brothers Jole Woodhead and Ben Woodhead. His brother Ben is also a professional football player. Woodhead completed his early education from North Platte High School. In 2008, he graduated from the Chadron State College. 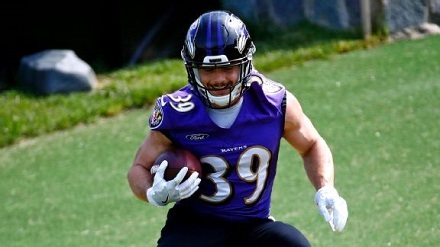 Danny Woodhead started playing football since his school days and broke many records. 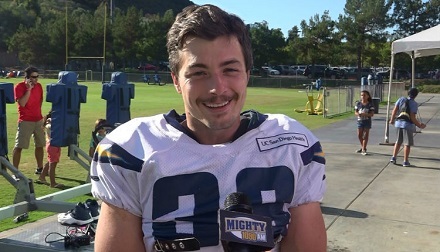 Woodhead helped his school team to reach the finals by beating Millard North High School in 2001. But his team failed to win the final match. Moreover, he also participated in the senior seasons. Throughout his school career, he made different records. In 2004, Woodhead joined Chadron State College for his higher studies. He continued playing football in the college too. He was the first recipient of a full athletic scholarship at Chadron State in the whole history of 96-years. In 2006, because of his excellent performance, his team reached the NCAA Division II playoffs but his team failed to get the victory. However, in 2007, he broke a record in the match against Abilene Christian University's Bernard Scott at Division II. Woodhead became the college football’s all-time leading rusher in 2007 after the match against Western New Mexico. In the following match, he broke the record of R.J. Bowers, who played for Grove City College in Division III school. However, he is only the sixth NCAA Division II player to rush for more than 1,000 yards. Moreover, he is the second player to score more than 100 touchdowns. Woodhead was nominated as the candidate for Harlon Hill Trophy in 2004, 2005, 2006, and 2007. However, he just won the 2006 and 2007 trophy. New York Jets undrafted Woodhead for 2008 NFL Draft. He played his first match for the club against Philadelphia Eagles on September 3, 2009. On October 25, 2009, he helped his team to win the match against Oakland Raiders. On September 18, 2010, he signed a new deal with New England Patriots. He played his first match for the club on September 26 against Buffalo Bills. Moreover, he also played a significant role to win the match against Miami Dolphins and Indianapolis Colts. On November 19, 2010, he signed a new two-year extension with the club. After that, he continuously played for two years. Later on March 15, 2013, Woodhead moved to San Diego Chargers. He signed a deal for two years at $3.5 million including $1 million bonus. His first debut for the club was against Cowboys. With his excellent performance, Chargers was able to get victory over many clubs. During his match against Miami Dolphins, he scored his career's highest amount of touchdowns. Well, on March 9, 2017, he signed a new three-year contract with Baltimore Ravens. Danny Woodhead is a married man and is blessed with a happily married and family life. Woodhead tied a knot with his beloved wife Stacia Woodhead in 2008. This couple has two daughters named Gia Grace and Maisy and a son named William. Woodhead is equally maintaining his professional as well as family life and is often seen spending his time along with his family. Besides this, there are no any records of his other relationships. This couple is happily and successfully maintaining married as well as family life since a long time, so there are very few chances of having their divorce. 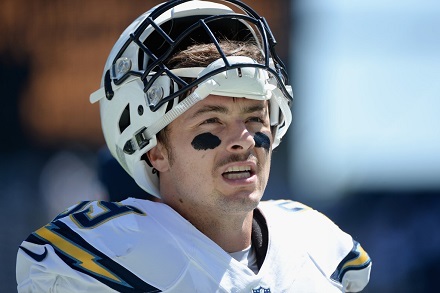 One of the famous player Danny Woodhead has a good net worth. His current net worth is $5.5 million which is totally worth. Recently he signed a new 3 years contract with Baltimore Ravens for $8,800,000.